We offer an interesting scenario of the corporate game for the guests of city (and not just guests). The game is held in the heart of the glorious city of Lviv. Participants have the opportunity not only have fun and interesting time, but at the same time get a full tour of the city. The plot of the quest is based on ancient legend of the golden treasure of Lion and his quest is: We know that once was drawn up the location map of the treasure but with time, for reliability, it was cut into many pieces and hidden, as stated in one manuscript “somewhere around Lviv lions. “Many treasure hunters were digging the area and even overturned the poor lions, but without finding the treasure … This led to some inconvenience citizens. There was a rumor that it was just a beautiful legend that had no real basis and then over some time “gold fever” abated. Lviv city council even issued a special law which obliged preserve peace Lviv lions. 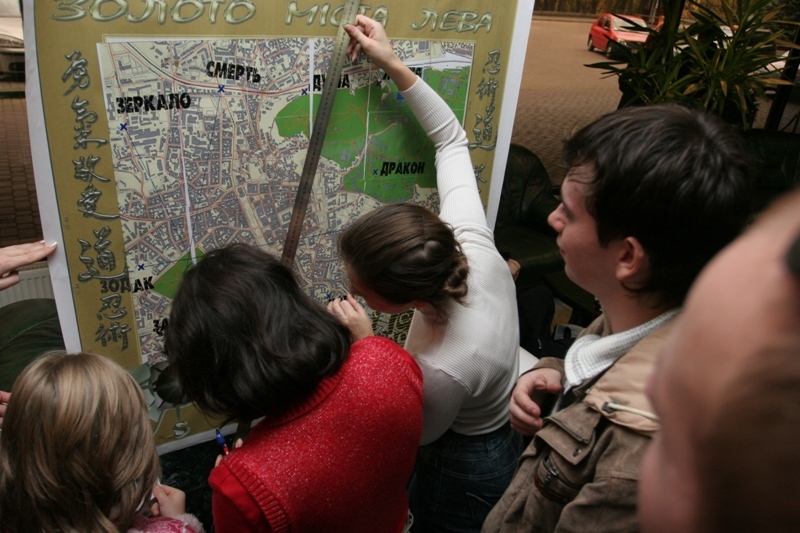 But recently, when there was the preparation of municipal facilities for the football championship, after the renovation of the old lion there were found some maps, which is believed by historians were parts of the legendary map indicating the location of the treasure. And it all started again. All the old and young, rich and poor people began to search for places where the lions still possible are, or their location in the past, hoping to find the rest of the map. Some officials in the guise of repair of streets even digging them personally making sure that workers are not accidentally found the particle cards and took them for themselves. But all search was not successful. Step number 2: Objectives and excursion elements: the group after receiving the task and map of the trip start the moving by itself. Throughout the route group need to perform the main task – to find the location of “Lviv lions” with the set photos and take pictures of that place. (Note: in Lviv on various architectural monuments – bas-reliefs, monuments, etc. are more than five thousand images of lions). At the end of the game each team exchanges their photos to cards on which can be determined where the treasure is: a chest of “gold” (chocolate) coins with the company logo. To pass on the route each team must perform the following tasks: go to the guide, get a “portion” tour, performing at the end of the tour guide job, meet with a “classified” agent. After completing the task of the agent you are able to get help such as future directions where to go till the next guide, etc. until you reach the finish line, not forgetting to pay attention to the search of lions.